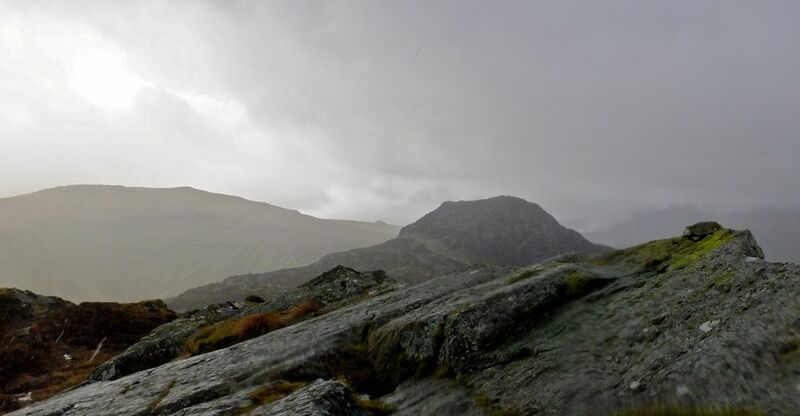 The summit of Eagle Crag: the tilted slab of rock peaks to the right. Sergeant’s Crag is in the middle distance, High Raise in the background to the left. Height: Wainwright’s approximation of 1650’ is clearly too low: the revised edition acknowledges this. But there remains no official ‘spot height’ on the summit of the fell (and note that the fell itself is technically nameless: on the map, the words ‘Eagle Crag’ clearly refer to the crag, not the fell itself). Chris Jesty acknowledges that the height must be ‘at least’ 1700’, and Memory-Map, which usually underestimates altitudes a bit, let me get up to 1704’. Volume: Book 3 (The Central Fells). 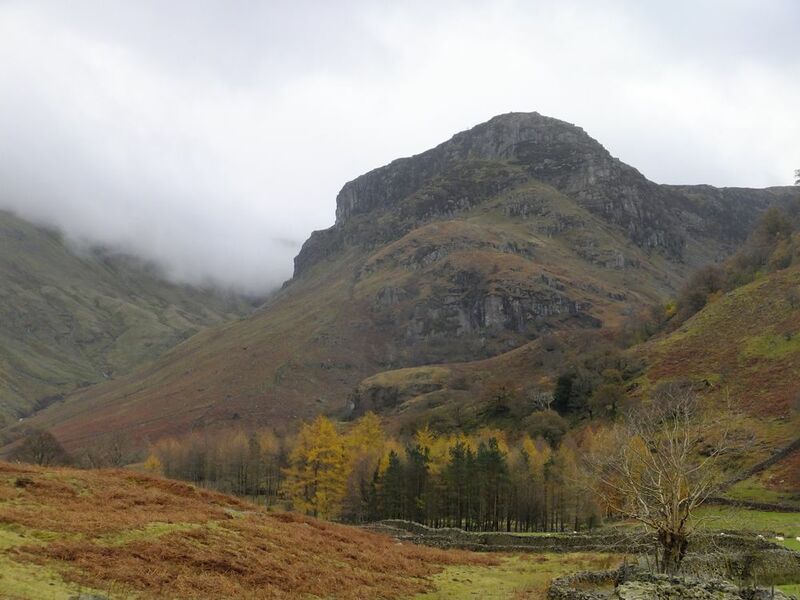 Eagle Crag, from Stonethwaite. The route up the face will be easy enough to trace on this photo to anyone who owns Wainwright’s volume 3. Route of ascent and descent: Ascended from Stonethwaite, straight up the face of the fell (Wainwright’s ‘Route A’). Left on the ridge to Sergeant’s Crag. Sergeant’s Crag and, to the right, in shadow, Eagle Crag, looking a totally different shape from this angle. Picture taken on walk 45, 7th October 2011 – and, of course, the banner image at the top of this site. 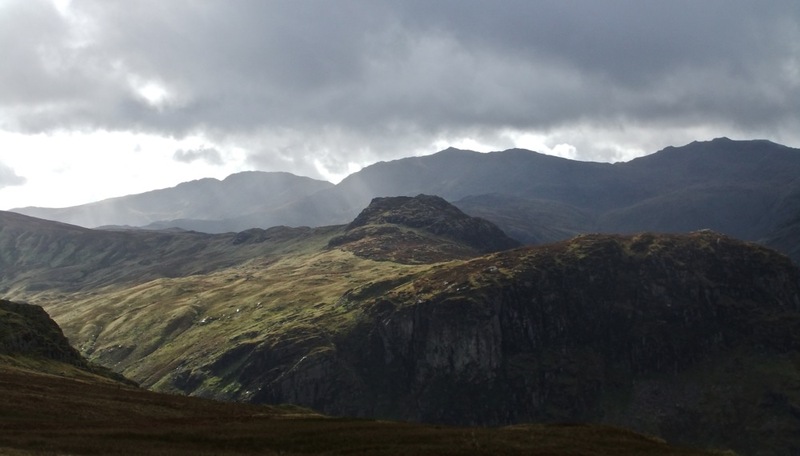 What I say: I thoroughly enjoyed the ascent of Eagle Crag. Once the initial haul up by the old wall was done, and the stile crossed, everything from there on up – the short gully, the crag itself, the terraces, the summit, and the view (particularly of Sergeant’s Crag and Langstrath) – are all well worth the bother. I see no reason why this ascent can’t be enjoyed by everyone: there are two short stretches of mild scrambling which probably put it out of the reach of anyone under the age of 7 but now I’ve done it I would feel safe taking Joe up there next time. It is certainly less difficult than it looks from below, and certainly easier than, say, Mellbreak, which is otherwise comparable in size and gradient. The summit is also a neat little spot (though I’m not sure I would class it as ‘top 6’, as Wainwright does); and generally the fell is very photogenic. I can’t see you need to ask for much more than that. Highly recommended.